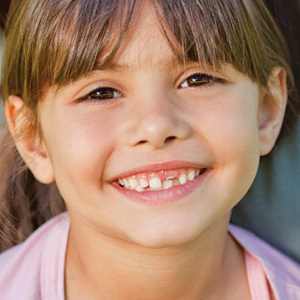 Somewhere around age 6, your child’s primary (baby) teeth will begin to give way to their permanent set. If all goes well, you’ll notice all the front teeth erupting in the right position: the top teeth slightly overlapping the bottom and all coming in without crowding. Sometimes, though, the process doesn’t occur as it should and a bad bite (malocclusion) may develop. You can get a head start on treatment if you know what to look for. Here are a few problems for which you should see a dentist — or more likely an orthodontist — for a thorough evaluation. Spacing problems. Teeth should normally come in right next to each other without a noticeable gap. But if you notice excessive space between the permanent front teeth especially, this may be an indication there’s a discrepancy in size between the teeth and the jaws. At the other end of the spectrum, if teeth on the same arch appear to overlap each other, this indicates crowding in which there’s not enough space for the teeth to erupt properly. Bad bites. Malocclusions can take different forms. In an underbite, the front bottom teeth bite in front of the upper teeth. If there’s a noticeable gap between the upper and lower teeth when the jaws are closed, this is known as an open bite. Front teeth biting too far down over the lower teeth is a deep bite and could even include biting into the soft tissue of the hard palate. Cross bites can occur in either the front or back teeth: if in the front, some of the lower teeth will bite in front of the upper; if in the back, some of the lower teeth bite outside the upper rather than normally on the inside. Abnormal eruptions. You should also be alert for protusions, in which the upper teeth or the jaw appears to be too far forward, or retrusions, in which the lower teeth or jaw appears to be too far back. You should also be concerned if permanent teeth erupt far from their normal position — this is especially likely if the primary tooth was also out of position, or was lost prematurely or not in the right order. If you would like more information on monitoring your child’s dental health, please contact us or schedule an appointment for a consultation.